The Catalogues are Coming! The Catalogues are Coming! The seed catalogues have started to arrive in the mail. Have you been getting them too? When they first arrive, the first week of the new year, it is always a bit startling don’t you think? Like, we’ve only just survived Christmas and you want me to think about Spring planting??? It’s just too far away. But then I flick through a little… And then something pretty catches my eye… And before I know it I am sucked in and pouring over onion sets and garlic bulbs and row covers. I’ll admit, it’s a sickness. 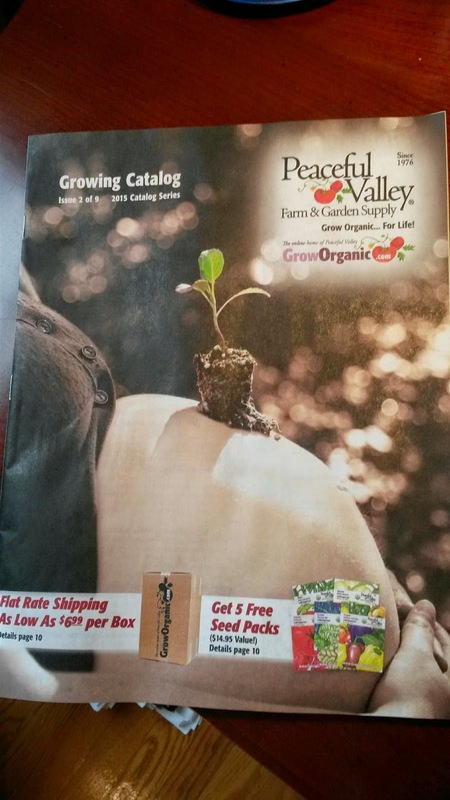 My favourite seed catalogue is from Peaceful Valley. They’ve always been great to work with, their products have always arrived safely (including the multi-graft fruit tree I bought from them) and the plants and seeds have always done well in my garden. Oooh, my fav catalogue! Peaceful Valley. Inevitably I buy too much for my little vege garden and it feels wasteful to have all these seeds and nowhere to put them. But what am I to do? The packets cost so little and there can be hundreds of seeds inside. Even when using the Square Foot Gardening technique where the garden area is intensively planted I just don’t have enough square footage to use up all the seeds in the packets. Sometimes I get lucky and can find a friend who will split the garlic bulbs or the seed potatoes with me but for most things I’m on my own. 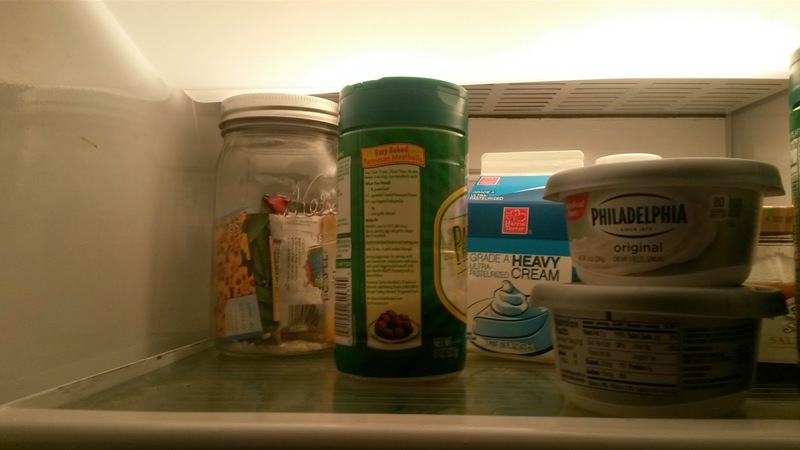 So this is what I do … I store them in the fridge for next year! I kid you not. Look. Top shelf in my fridge. See the large mason jar in the back? I’ve done this for the past three or so years and truly it works. I take a large mason jar and add a teaspoonful of rice grains to the bottom to absorb any moisture that might be lurking. 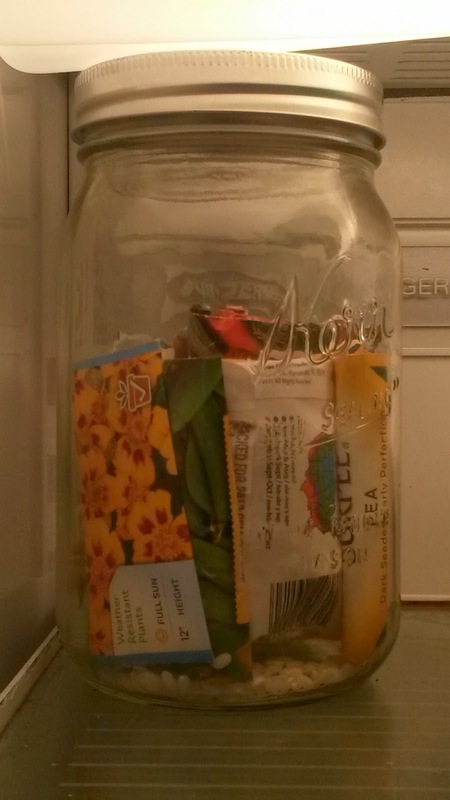 Then after planting I bundle up whatever seeds are left in the packets, stick them in the jar, shove it in the back of the fridge and forget about them until planting time next year. I do add an extra seed or two per planting hole once the seeds get to be a couple of years old but I’ve found that they still germinate just fine despite the long cold sleep they’ve had. Amazing, right? And economical. You can see the grains of rice in the bottom – a natural desiccant. I’m thinking about ordering yellow and red onions, Italian Purple Garlic, and Russian Fingerling potatoes. Anyone want to split the volumes with me? What are you planning for your Spring garden this year? ← New Blog! Premier Post!